Chapattis, the second bread I made this year, were also notably the first bread of the project that I had never made before. My forays into breadmaking until that point had been geared mostly towards my favorite type of bread, that holy grail of home baking: the Perfect Artisan Loaf, with its thin, crisp, shatter-y crust that concealed the most gossamer interior, chewy and just barely sour. Flatbreads? Well, they sell those in the store, right? Yeah, they do; but they also sell pre-cut apples, and you certainly don’t see me tossing those abominations into my basket, do you? And after the ease of making these simple, elemental flatbreads, I don’t know that I’ll buy those dry cardboard pitas again. Besides, I have come to love Indian food so much in recent months, that I can’t imagine not having an appropriate (and easy) bread to serve alongside the curries and dals I’ve been turning out of late. In researching that aforementioned Indian food, I inevitably read up on the breads as well. And wouldn’t you know it, I learned something new! Apparently, the best chapattis (what do I strive for, if not the best?) 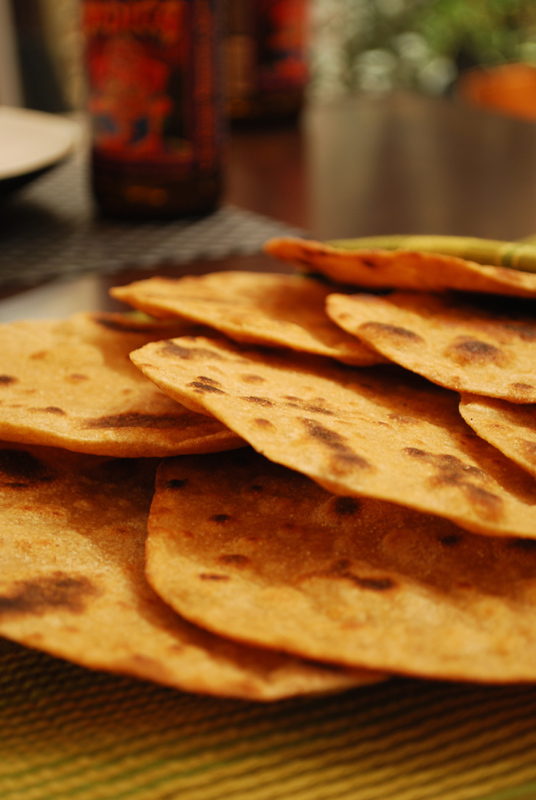 must be made with atta flour, a very finely-milled whole-wheat flour unique to India. Typical American whole-wheat flour is simply too coarse to properly achieve the correct texture. And man, are people ever devoted to their atta flour! Cooks from here to Mumbai insist that one brand or the other is absolutely the only one you should ever use. Ever. But Indian atta flour can be tricky to find in the US, and can be expensive to order online, especially for the sake of one lone recipe. Then, lo and behold, I saw one small note on one lonely webpage: a state-bound Indian cook, searching for the bread of her home soil, had tried King Arthur’s White Whole-Wheat flour (they sell it at my corner market! ), a very finely milled whole wheat flour. And this lady claimed that it not only worked, but she preferred it to her old favorite atta flour. Ding! In my research, I learned that atta flour typically has a high protein content, but I couldn’t find exactly what that percentage is. (Remember, protein in flour produces gluten in your baked product. More protein = more gluten = more toughness, which is sometimes good. For reference, all-purpose flour has around 9%-11% protein, and bread flour has 12%-14%. Generally speaking, flour substitutions rely mainly on this number – which is why you’ll never make a tender cake with bread flour, or a chewy bread with cake flour.) So if atta flour has a high protein content, what is the protein content of King Arthur’s White Whole-Wheat flour? I decided to contact King Arthur Flour, and see if they could shed any light on the issue. A representative told me that their White Whole-Wheat flour has around 13.5% protein. A ha! This puts it well in the range of being described as “high protein”. So this flour has a favorable protein count, and is finely milled; the two main characteristics of atta flour were there! I, of course, had to try it. Unfortunately, as much as I love Indian food, my experience with eating a well-made chapatti is… well, I don’t remember what they’re supposed to taste like. Naan? Yes. Chapatti? No. But I can tell you this: these chapatti rolled out just beautifully, especially compared with my first go at this bread. That may have been the result of a longer resting period (I let these go almost 2 hours, as opposed to a 30 minute nap the first time out); but the higher protein count in this flour gave the breads a fantastic chewiness when cooked. 1. Whisk together flour and salt in a bowl. Make a well in the center, and pour in the water. Mix with a fork until a shaggy dough forms. Turn out onto a surface and knead until smooth and elastic, about 8 minutes, adding only enough flour to prevent sticking. Transfer to a lightly-oiled bowl, cover with plastic wrap, and let rest at room temperature for at least 1 hour. After this rest, the covered dough may be refrigerated for 12 to 24 hours before using. 2. Divide dough into 12 equal pieces and roll gently into balls. Cover the ones you aren’t rolling out, with plastic wrap or a kitchen towel (not terry cloth). On a floured surface, roll each into a thin round, about 5 to 6 inches across, rotating and turning the dough to keep from sticking. They will be very thin. Cover the rolled out chapattis (do not stack). Repeat with remaining balls of dough. 3. Heat a griddle or skillet (cast iron is best, but whatever you have will work) over medium to medium-high heat. Lightly grease the pan with a paper towel dipped in oil, place one chapatti in the skillet, and cook about 30 seconds, or until golden brown in spots. Flip and cook for 30 seconds to 1 minute, or until well-browned in spots, pressing air bubbles out if necessary. Flip again and cook another 30 seconds to 1 minute, or until fully cooked. Bread may puff up, and should have an even distribution of brown spots. 4. Place on a clean plate or baking sheet and keep warm in a 250 degree oven. 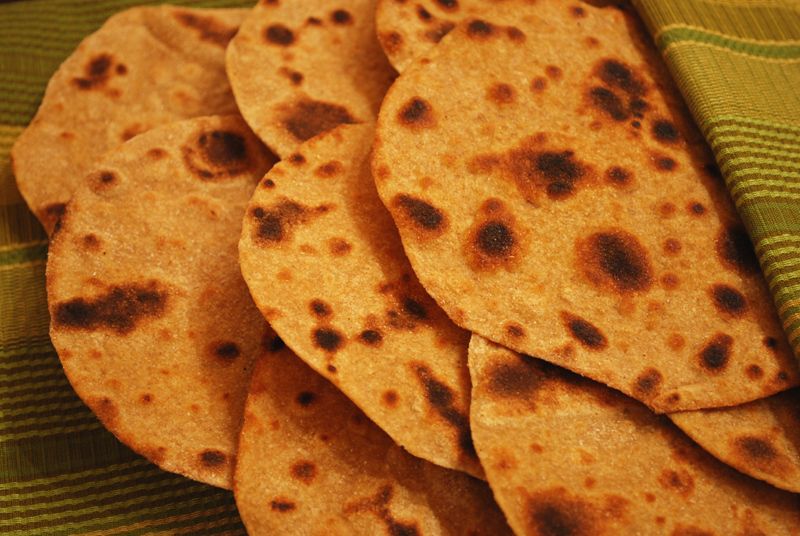 Chapattis taste best served warm, but they are fine at room temperature also. 1. If you can’t find either white whole-wheat flour, or atta flour, you can substitute regular whole-wheat flour; but be warned that the texture will be a bit different. 2 Responses to Chapatti, Take Two! Atta is commonly found in Indian grocery stores, and is significantly cheaper than “white whole wheat” flour. I shelled out for a bag of white whole wheat, took one sniff and immediately recognized it at atta. If you haven’t been to Devon Street, you should go – I assure you that there are dozens of places to buy atta in Chicago! It is most definitely NOT hard to find in the US – there are Indian populations everywhere, and even the tiniest Indo-Pak market will carry a good selection of atta. Pamela: I agree, if you have a good Indian market nearby, that’s definitely a cheaper source for atta. Having lived in Kentucky and Alabama, however, I can assure you that not every location in the US has such an amenity. Score one for living in Chicago! I offered white whole wheat as an alternative, because many national grocery stores do carry that, and it might be easier to find for some people. And, oh my, yes, I could spend hours on Devon street. So many interesting and colorful stores! Love it! Thanks so much for the comment, and happy baking!